Any garden will understand what I’m saying. 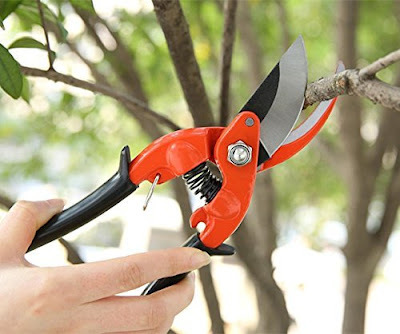 You see a neat looking set of gardening shears, you’re getting ready to prepare the yard for winter and you get excited at the prospect of using a new gardening tool. I was excited to be getting these shears. Then I opened the box. To my absolute shock, the Ohuhu Traditional Bypass Garden Shears ($12.99) were opened and oiled! Obviously, they had been used! Who does that? Who sends out a used item for review? That alone put me off of recommending that anyone purchase from this company, but I’m a trooper and I wanted to give the company the benefit of the doubt. Sadly, the pin that holds the blade in place slips out. That is not a safe situation and it wasn’t as if I was roughing it with these shears. Light yard work was all that the shears were used for. If I had a way to give this brand a thumbs down, I would. But as always, my experience is just that – my experience. You may have a different one. So, if you’re in the market for “maybe gonna work” gardening shears, visit Amazon.